The sciatic nerve is the largest singular neurological tissue in the body and is the pathway that innervates sensation and motor ability to the buttocks, legs and feet. The sciatic is also one of the most villainous structures in the human body, being cited as the cause of the most notorious of all lower body pain syndromes: sciatica. Sciatica is a much misunderstood topic. Most patients have no idea of the real facts involved in sciatica conditions, nor how pain is even generated in this huge nerve. 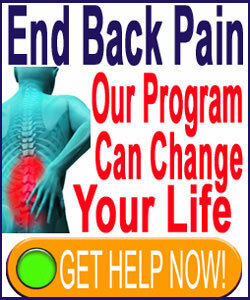 Since sciatica is one of the most difficult health issues to resolve, we feel it is time that we provided a comprehensive look at his nerve and its capabilities in creating pain that often disables its hapless victims. This background essay provides an anatomical model of the ischiatic nerve and explains the various mechanisms through which pain can involve the nerve or the nerve roots that comprise it. If you have ever suffered with buttocks, leg or foot pain that was linked to this crucial nerve structure, then this article is a must read. The 5 nerve roots that compose the sciatica nerve include the 3 most often implicated spinal nerves theorized to suffer from pathology due to compression and/or chemical irritation. These include L4, and especially L5 and S1. These nerve roots are designated as the source of more lower back pain syndromes than all others combined. No wonder sciatica is such a common symptom set, but if the condition is properly diagnosed and appropriately treated, then why does it rarely resolve? Once the 5 individual nerve roots fuse together to form the sciatic nerve, the structure continues on its path downwards in the leg on each side of the body. It passes under the piriformis muscle in most people, but in about 20% of people, the nerve actually goes through the substance of the piriformis instead. This is one of the possible explanations for sciatica pain that is not linked to spinal nerve root pathology. Since the nerve exists in the substance of the piriformis muscle, it can easily be constricted if these muscular tissues go into spasm. However, even when the nerve demonstrates typical travel under, rather than through, the piriformis, compression can still occur due to cramping of the muscular tissue. The fully formed sciatic structure is the largest nerve in the body and exists bilaterally in each leg. Within the substance of the leg, each branch of the sciatic nerve breaks up into smaller nerve tissues that serve more regional areas of the leg and foot. Nerve components travel down the back and sides of the leg and different nerve root constituents are responsible for providing innervation to the various parts of the lower body anatomy. These regions of innervation for both sensation and motor function have been accurately mapped on neurological charts. Learn everything there is to know about the sciatic nerve on our comprehensive and expert-written website Sciatica-Pain.Org. 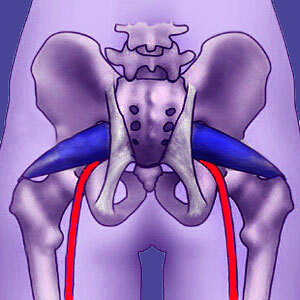 Sciatica describes a symptom set of pain, burning, tingling, numbness and/or weakness, as well as possible functional deficits in the buttocks, legs and/or feet that is caused by structural compression or chemical irritation of a lumbar or sacral spinal nerve root before the sciatic nerve is fully developed. In essence, the root is damaged prior to it forming the sciatica nerve, and so passes its dysfunction along to the entire nerve structure. Pseudo-sciatica is an identical pain syndrome in symptomology and expression, but does not occur due to compression of a lumbar or sacral root. There are many more explanations for pseudo-sciatica than for true sciatica, including piriformis syndrome, sacroiliac joint issues, cervical or thoracic spinal stenosis, localized sciatic injury, diabetes, disease process or mindbody causation via ischemia of the nerve or root constituents. The many variations on sciatica and incredible diversity of potential causes, all generating similar symptoms, pose a huge hurdle of diagnosticians. It is therefore no surprise that sciatica is one of the most widespread, difficult to resolve and persistent health issues in the chronic pain sector. You can learn more on the role of the sciatic nerve in a diversity of pain syndromes on Sciatica-Pain.Org.